I’m sure you’ve heard people say that Venice is sinking and truth be told it is. Once referred to as the “Floating City”, Venice is now sinking at a rate of 1-2mm each year, this is 5 times faster than predicted. Just one of the many reasons why you shouldn’t wait to get lost in Venice, if you wait too long this beautiful city may no longer be what it is today. And what exactly is Venice today? Venice is a group of small islands, 118 of them to be precise. The city wasn’t built directly on the surface of them, but on supported wooden platforms. These 118 islands make for 177 canals which are connected by exactly 416 pedestrian friendly footbridges. The most famous and largest of the canals, namely The Grand Canal, splits the city in half with its unique S shape. There are 3 ancient bridges that span across the Grand Canal, the most famous being the Rialto Bridge. Along this canal, and others, you’ll find many many restaurants, cafes, bars, shops, etc. At night the buildings along the canal are lit up and reflect off the water most beautifully. Within these canals you will find Vaporettos, otherwise known as the public water buses, which are the second best way to get around. You can purchase an unlimited day pass for 20e (2 days for 30e, or 3 days for 40e); this is much more economical than the 7.50e ticket per ride. Note- you must purchase a ticket before getting on the boat, as I witnessed people get caught without having a ticket be charged with a hefty fine! Some of the larger water bus stations have ticket offices where you can purchase them directly from an attendant. Otherwise you can buy them from an ACTV touch screen ticket machine or even from a newsstand, which is where I got mine. Before boarding the water bus there is a machine outside where you must scan your ticket to validate it, again if you don’t you could be subject to a fine. If you purchase a day pass, the 24 hour time period begins once you scan your ticket for the first time. Also- it is important to note that the water buses will come from both directions, so be sure to pay attention to which one you are getting on. It’s not as hard as it sounds, I promise. Besides, the worst thing that can happen is you get on the wrong one and enjoy a nice boat ride. The Vaporettos aren’t the only way to get around Venice, in fact if you recall I said they were the second best way to travel. The best way I will argue, is on foot. Besides, the Vaporettos only run along the two major canals and around the outside of the city so it isn’t possible to fully appreciate the charm of Venice if you don’t explore. And by explore, I mean get lost. In fact, getting lost is my number one recommendation of things to do while in Venice. Lucky for you, you won’t have to try very hard to do so and most likely you will get lost unintentionally, as there are so many streets and twists and turns, that each turn will lead you to another unique street which leads to another street or to a square just waiting to be explored. Venice receives 18 million tourists a year which comes to 50,000 tourists a day, I guarantee not one of them experienced Venice without getting lost and if they did, then they surely missed out. You’ll find that majority of the streets don’t lead anywhere, you’ll find many dead ends leading to the water, and if you’re lucky you’ll find a bridge to lead you to another area to get lost in; but this is half the fun. The word Calle, in Venice means street, and is a sign that you will see everywhere. The numbering or addresses of the buildings in Venice don’t correlate to the street name as is typical of most places, so you can’t rely on those if you’re looking for some place in particular. Therefore, the best way to remember where your hotel or Airbnb is, isn’t by the address but by the proximity to a landmark you can remember. Fun fact- the narrowest street in the world is found in Venice at only 53cm wide, and it is called Calletta. If you get lost enough, you may stumble upon it. Piazza San Marco is the most famous square in Venice, in fact it is the only square with the name “piazza”, all of the others are called “campo”. Here you will find the Basilica di San Marco (St. Mark’s Church), Palazoo Ducale (Doge’s Palace), Campanile (the famous Bell Tower), Torre dell’Orologio (the Clock Tower), and many pigeons along with other notable buildings aligning the square. Lines to enter Doge’s Palace and St Mark’s church were crazy long and I chose to just enjoy them from the outside. Similar to the Colosseum and the Vatican in Rome, these are the two most popular attractions in Venice and many tours and skip the line passes are available if you do choose to go inside and don’t want to wait. There are 170 bell towers in Venice, with San Marco’s being the tallest and the 5th tallest in all of Italy. The reason I was okay with skipping this one was because I was let in on a local’s secret which I’ll happily share with you. There is another bell tower just across the canal directly in front of Doges Palace found on S Giorgio island, instead the beautiful church of San Giorgio Maggiore. You can reach this island via water bus, the stop is called Isola di San Giorgio and if you take Vaporetto n2 from Piazzale Roma just in front of San Marco’s square, it is just one stop away. Once you reach the island, you can’t miss the church. Once inside, getting to the top of the bell tower couldn’t be easier; no lines, no crowds, half the price, and there is even an elevator to take you right to the top. Here you will see a 360 degree view of the Adriatic Sea, Piazzza San Marco, and the Lagoons; this was probably my favorite spot to get lost in Venice. Now that you have mastered the Vaporettos, it’s time for another adventure. There is another water bus station near San Marco called San Zaccaria. From here catch a waterbus and take a day trip to the nearby islands of Burano and Murano (no more than 30 minutes away). Famous for the Venetian glass shops, lace, and colorful houses, these are a can’t miss when visiting Venice. I recommend a few hours here before heading back to Venice; browse the shops and admire the arts, take photos of the houses, and stay for lunch! 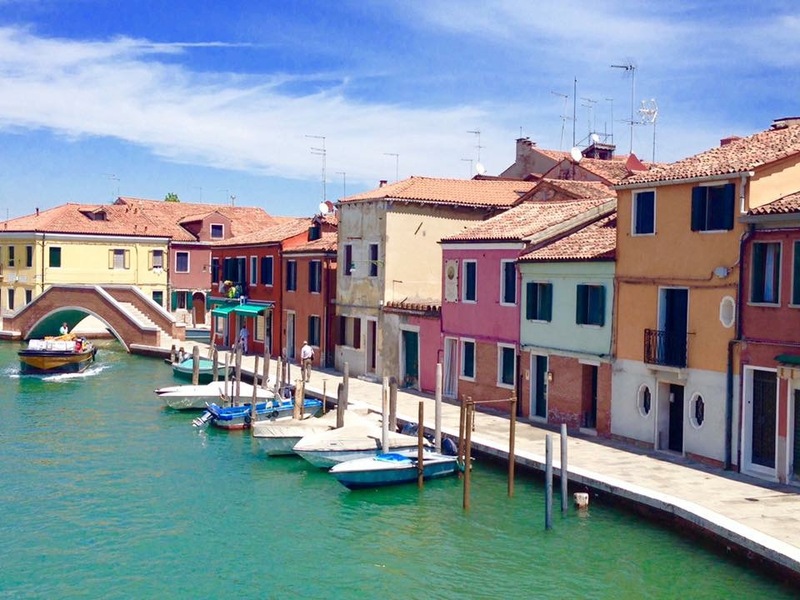 Not only can you get lost in Venice, but you can easily get lost in these colorful islands too! As true to most of Italy, the food is amazing. Venice has something called “cicchetti” which is something you must experience. It’s similar to tapas or apertivo if you are familiar with either- but basically it’s a small meal typical after lunch and before dinner. Prices range from 1-3e per item and it is common to choose a few to enjoy along with a glass of wine. Speaking of drinks- the spritz is the most popular cocktail of the region, be sure to try one of these too at some point during your visit. Although, it wasn’t my favorite, it is part of the culture as a before dinner drink. 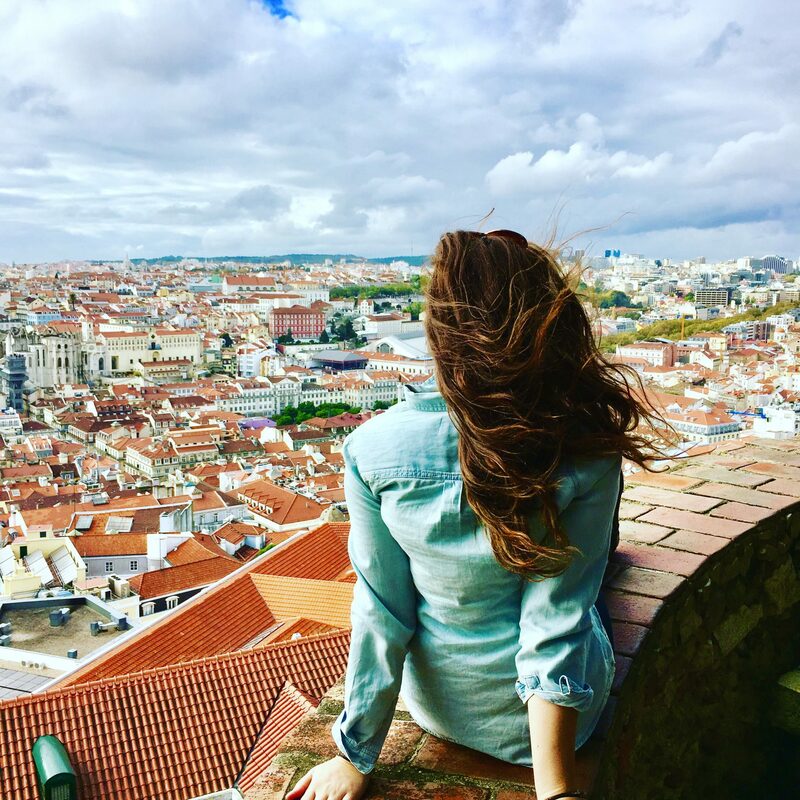 If you have already experienced getting lost on your own and discovered some amazing spots while doing so, I recommend taking an organized walking tour if you have a free couple of hours to spare. These tours are typically run by locals who volunteer their time to share the love of their city with others. If you google “free walking tour Venice” there are multiple companies that come up; just register ahead of time and you’ll receive an email with the meeting place. Note- these tours are free however they are tip based, and usually last 2-3 hours. This made for an enjoyable evening as I learned a lot about the history of Venice, some of the culture, and some fun facts about places that I otherwise would have walked past without noticing. As an example, on the tour I did we walked over the Borgoloco Bridge, which I will admit seemed like any other of the 416 bridges. But upon looking closer, the tour guide pointed out that the iron in the bridge formed from the initials VVE; which stands for Viva Vittorio Emanuel. We then learned that in the 19th century, Venice was under rule of the Austrian Empire. This coded message in the bridge allowed the patriots to support their future king of Italy- Victor Emmanuel. Pretty cool! And of course, a blogpost about Venice isn’t complete without talking about the gondolas. There are over 400 gondoliers in Venice. Fun fact- the first female gondolier didn’t happen until 2010 although I did not see any during my time there. As a tourist you’ll either be very excited about the gondolas or think they are very cheesy. My opinion however, is that it is a must do! I will have to admit that I was surprised by the cost of a gondola ride, the cheapest one is 75 euros. However, this is the set price regardless if you have one person or ten, so if you want to experience this while saving money you could group up with other people and split the cost. If you want to be serenaded while on your ride, that of course is an extra 25e. I will also advocate to take your gondola ride at night, the canals are all lit up and it makes for a romantic treat. Venetian folklore says that if a couple kiss in gondola as they pass underneath each bridge they will remain in love forever, okay that part may be cheesy. You don’t have to reserve your gondola ride in advance, and you will find many stands set up along the canals that you just walk up once you are ready. We saved our gondola ride for our last night in Venice which also happened to be our last night of a two week Italy trip; it was a perfect ending! So what are you waiting for? Now’s the time for you to get lost in Venice… before it sinks! Great post, Venice is always stunning! previous post: Rome Wasn’t Built in a Day But You Can See it in One!